Just because some of us* think it would be cool to have our zombie-fied effigies consumed as cake in some sort of semi-ironic post-mortem ritual, I bet that’s probably one of the last things Audrey Hepburn had wished for herself. 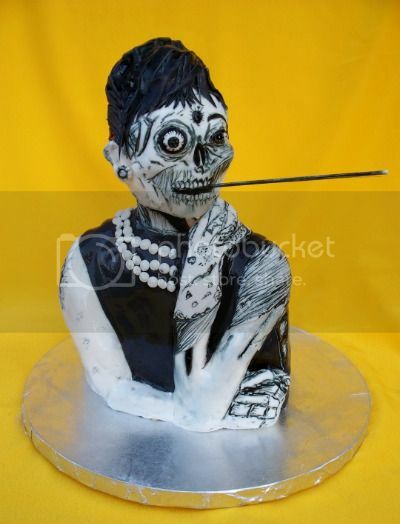 Which is probably exactly why you sick bastards will find such delight in this zombie Audrey Hepburn cake, based on the Zombie at Tiffany’s t-shirt at Threadless. I decided to use a very dense vegan cake recipe and baked a smaller cake to reduce the weight the cake actually had to support. [Editor’s note: i.e., 100%-edible, people!] I baked the cakes. I let them cool. I stacked the cake. I carved it. I put buttercream on it. I put fondant on it. I painted it. It took a long time. Then I was done. The End. Yeah. That’s how I like my zombie cakes. With buttercream and incredibly dry, literal descriptions.